I like to find ways to cut down on our expenses by doing things myself or making my own version of a store bought item. Now making my own doesn’t always mean it saves me a bunch of money, but sometimes it really is a money saver to make your own. But this diy laundry soap is a money saver for sure. It’s an easy diy laundry detergent that just cost pennies per load. I shared my original recipe for diy laundry detergent a few years ago, and never thought about it not having a scent to it. But a few friends who tried the recipe said they missed the scent and went back to purchasing store bought detergent. Since then, a new product emerged on the market, it’s in the washer scent boosters. Products like Unstoppables and Purex Crystals. I saw a few other detergent recipes on Pinterest that added these scent boosters to homemade detergent. Which gave me the idea to add some to my laundry detergent recipe, solving the problem with the scentless laundry that some of my friends didn’t like. Here’s the new and scented version for DIY Laundry Detergent recipe with a video to show you how to make it too. Keep going passed the video if you would like to see the cost breakdown and measurements to make a smaller batch too. Grate the bar of Fels Naphtha soap. I like to use the fine grater to grate the soap. The smaller the pieces the easier it is to distribute through the laundry detergent. In a large bowl, mix the grated bar soap with the washing soda, crystals, and borax. 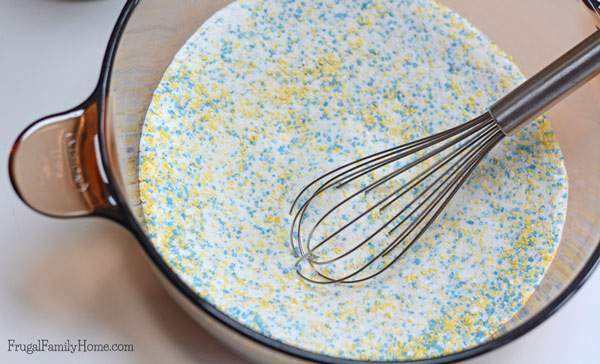 Use a whisk to mix them well. Store in a container or a zipper bag. Use 1-2 tablespoons per load of laundry. When you are making something at home yourself, sometimes it’s because it’s just better than the store bought items other times you make your own to save money. Knowing how much it cost to make the product at home can help you determine if it’s really less expensive or not. Just so you know, the links below are my referral links which means when you use purchase through them I can make a little money at no extra cost to you. Thanks for your support in this way. You can read my disclosure policy for more information. This little bar is a powerhouse of cleaning. I not only use it in my laundry detergent but have used it on carpet and to get stains out of clothing as a stain pre-treater bar too. I purchased my bar of Fels Naptha at my local grocery store for $1.39. 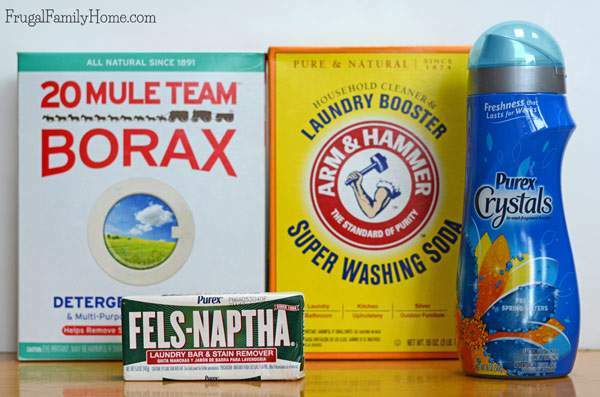 Borax is a great laundry booster. You can use it alongside regular detergent or add it to your own diy laundry detergent. I also use borax in the ant bait I make. I really should share that recipe soon. I purchased my 65 oz box of borax at the local grocery store for $5.29. Make sure you get this in the laundry aisle at the grocery store. You don’t want baking soda, be sure you purchase the washing soda. It can be a little confusing since they are both made by the same company. I purchased my box of washing soda for $3.99. I went to the store with the intention of purchasing the Downy Unstoppables. The last time I purchased a bottle, it was on sale and I had a coupon. I don’t buy these products that often. I almost fell over dead when I saw the price of $6.99 on the Unstoppables, no sale, and no coupons. 🙁 I looked over and saw the Purex Crystals and was sold on them at just $3.49 a bottle on sale. Yes, I did cheap out here. I’ve used both in the diy laundry detergent choose the one you like the best. I did find a laundry detergent kit at Amazon, it contains the borax, washing soda, and three bars of Fels Naphtha. You would only need to pick up the fragrance booster at you local store. That might be a good way to go if you can’t find the products at your local grocery store. The total cost for a full batch of laundry soap was $14.16. This will make enough laundry detergent for us for a full year which works out to less than $.10 per load of laundry. I’ve used this laundry detergent in my top loading washer and it worked great. I now use it in my front loading washer and it works just as well. I add a tablespoon of laundry detergent right into the tumbler and load the clothing. If you are like me and don’t have anywhere to store a full batch. You can make a quarter batch with these measurements below. This amount will store in two quart size canning jars with plastic lids. I would love to hear if you’ve tried making your own laundry detergent before. How did it work for you? You can scroll down and let me know what you think of this laundry detergent recipe in the comments below. I am a Diy person, but I never thought of laundry detergent. This is a great recipe. It’s super easy, cheap, more importanly very effective. I couldn’t believe it. Everything cost less where I live. For me was just 10. 22. We have no taxes in De. Thank you for sharing this awesome idea. Truly is a money saver. Gloria, that’s great you were able to find the items to make the laundry detergent for less. We use this recipe all the time and love it too. If you make a batch and use it AS DIRECTED it should last a very long time. Louise, I mix up enough laundry soap for 6 months at a time for our family. It lasts without any problems for us in an airtight container. Ileana, The scent really does stay on the clothes. I have used this recipe minus the fragrance crystals most of my life. The liquid formula is also a favorite of mine. For those who live in an area with hard water, the dry formula may not dissolve well so the liquid would be a better option for them. Nothing upsets a woman more than pulling a load of laundry out of the washing machine and finding all that undissolved soap on everything. We do have hard water. Can you share the Liquid recipe, Jo? How do you make the liquid detergent?? Like the idea of saving money on laundry soap?? Thank you. You will need a grater, a large plastic spoon, a measuring cup, clean jugs, and a large saucepan. Grate the soap and put it in a saucepan. Add 4 cups water and heat it until the soap melts. Add the washing soda and the borax and stir until it is dissolved. This will boil over very easily, so turn down the heat before adding the washing soda and borax. Remove from heat. Pour 4 cups hot water into the bucket. Now add your soap mixture and stir. Now add 1 gallon plus 6 cups of water and stir. Pour into jugs and leave at least 3 inches of headroom at the top. This will allow you to shake the jug to mix the soap before each use. IT MUST BE SHAKEN EACH TIME IT IS USED. Use ½ cup per load (shaking well before each use). This will not make suds! Is this safe to use on newborn clothes as well? Libby, I haven’t used it on newborn clothes since I wasn’t using it when my kids were little. I am allergic to most of the commercial laundry products on the market. I been using this minus the fragrance add on for past 5 years. Instead of the fragrance item I just add 1/4 cup baking soda to each load. It leaves the clothing smelling fresh and clean. It also takes the odors that are normally left in technical clothing out. Deb, thanks for sharing that tip, I appreciate it. I used it for my babies, our daughter and daughter in-law used it for their babies and none of us had any problems. We most always rinse the baby clothing twice and add a cup of white vinegar to the final rinse. The vinegar removes any soap residue and softens the clothing. I’ve used it (minus the crystals) on newborn clothes without a problem. If you cut the feels naptha bar into quarters and microwave it until it expands, it will turn to powder by barely squeezing it. This allows it to mix better with the powders. Also, this has been used on newborn clothes many times with no issues at all. Thanks for adding your tips, Cindy! You will need a grater, a large plastic spoon, a measuring cup, clean jugs, and a large sauce pan. Grate the soap and put it in a sauce pan. Add 4 cups water and heat it until the soap melts. Add the washing soda and the borax and stir until it is dissolved. This will boil over very easily, so turn down the heat before adding the washing soda and borax. Remove from heat. Pour 4 cups hot water into the bucket. Now add your soap mixture and stir. Now add 1 gallon plus 6 cups of water and stir. Pour into jugs and leave at least 3 inches of head room at the top. This will allow you to shake the jug to mix the soap before each use. IT MUST BE SHAKEN EACH TIME IT IS USED. Use ½ cup per load (shaking well before each use). This will not make suds! When using the liquid form, do you put directly in the drum or in the detergent slot? I just made this detergent and washed my first load of towels. I am disappointed that they didn’t have a pleasant odor even with using the purex crystals in the detergent. Doris, That is odd. Do you mean the fragrance wasn’t one you liked? Or there wasn’t any or enough scent to the clothing? Ours always has a faint scent to the clothes when we use this. If the scent isn’t strong enough for you, you might try adding more of the Purex crystals to the laundry detergent. My daughter has made this and a few drops of essentials for the scent. A suggestion I make if the fragrance isn’t enough is either adding more, or using essential oils. I recently made this from another blogger (who suggested 4tbsp per load, which is why i came here to see other suggestions.) I used it for the first time this week and only used about 2 per load. I smelled the clothes when switching from washer to dryer and they smelled amazing! When removing from dryer I was underwhelmed by the smell. Using a laundry mat may have been the issue, as the smell just smelled like hot dirty air. I also have not done my DIY fabric softener yet, so that may be the issue. But overall loved the soap. Thanks for taking the time to share your experience Jamie. I’m sure it will be helpful to others. A friend of mine turned e on to your laundry soap recipe. Best stuff I ever used. I’ll never go back to store bought laundry soap again. Just want to adda litte tip on the FELS NAPHTHA…if you stick in in the microwave (watch it, it is melts fast) to soften it up a little, you can either grate it up using a blender or a food processor. Works great and a lot quicker and easier on the hands. I make enough (powered soap) to fill a 5 gal. bucket at a time. Ken, thanks for sharing that tip. I’m sure it will be helpful to others who make a large amount of this recipe too. I’m so glad you like the laundry soap. Hi Shelly! Thanks for posting this recipe! How much would I add to a load if I have a top load with an agitator (not HE). Thanks! Dani, I used the same amount in my top loader washing machine too. Usually 1 tablespoon for regular load and 2 Tablespoons for large or heavy soiled load. I hope you enjoy the detergent recipe! Just wanted to say great recipe. Made my first batch last March,still have some but am going to be making new batch. Still smells as nice as when I first made it. Use 2 tbsps and clothes smell great. Made my own fabric softener by cutting up sponges and soaking them in 50/50 water and downy. Smells great. Sorry if this was already brought up but can this be used in an HE washing machine? Yes, I use it in my HE washer. I use 1 tablespoon per load. I hope that helps. Yay! Thanks for responding, you just never know with those washers what’s ok and what’s not. I used a similar recipe to make my own detergent. It did call for regular baking soda as well as the washing soda. Would that be the reason it doesn’t create any suds? I feel like I’m just washing our clothes in fragrance water. The DIY laundry detergent doesn’t make suds. I know when I first started using it I thought that was odd too but it still works great, it just doesn’t have suds. I’ve never tried adding regular baking soda. My recipe calls for both sodas ,reg and washing soda and oxi clean. Does this work on he machines too? Cari, I use this laundry detergent recipe in my front loading washer and it works great. I use 1-2 tablespoons per load. Do you put the soap directly in the with the clothes or in the cup where dry detergent goes? I put mine directly in with the clothes for my front loading washer, since mine only has a compartment for liquid detergent. It’s the one we use all the time too Barbara. I’ve never tried this and will but my question is does it get the clothes clean and remove stains? You mentioned using one or two tablespoons per load is that for an extra large load as it seems very little? Also when washing whites can you still add bleach to the load while using this concoction? Leah, It really does get the clothes clean with that small amount. It will remove stains that the average detergent from the store will but for tough stains we use a stain stick or pretreat the stain. We don’t use bleach at our house, my kids have sensitive skin. But becasue all of the items in this recipe are items found in the laundry asile at the store I don’t see why you couldn’t also use bleach when needed. I would check the boxes of the ingredients to see if any contraindicate using bleach with them to be sure, since I’ve never used bleach with this recipe. Maybe someone who has used this recipe with bleach also can comment and let us know. I have used bleach with this recipe and my whites are whiter then ever! Also I have found for extra hard stains if you use in a spray bottle filled half with peroxide and half with dawn dish soap stains and smell disappear nicely! My son plays football and all the stains come out and he also works on cars and has had Diesel on his clothes. Spray this on add some extra baking soda let soak for a couple hours and no more smell or stains! Heather, thanks for sharing your stain removing tips. I haven’t used your recipe (yet!) but I do have another one that I have been using for the past 4 years it uses a box of OxiClean in it also. We love it! I did use the crystals for the very 1st batch, but didn’t like the smell even though I chose one I liked. So I haven’t used any in the past. I use 3 bars of Fels Naptha that about a month or so before I think I am running out and need to make more, I open the 3 bars of soap and let them AIR DRY and that makes them so much easier to grate either by hand or in my food processor. I make a huge amount (a large glass container from Walmart holds almost all of the soap that I make!) I use a 2 TBSP coffee scoop from Dollar Tree to measure my soap. I have used 2 TBSP in my HE washer and it works great. If my husband’s clothes are extra dirty, I add a 1/2 cup of OxiClean to washer before putting in the clothes and wash as usual. Works Great! I use a Downy Ball and add white vinegar to the fill level and put that in my washer for my fabric softener….. Love your site! Sandy, Thanks for sharing your tips and I’m so glad you like the site. You just made my day! I was wondering if U can use this in the new washers that says only HE detergent ?? Wendy, I use this in my HE washer regularly without any problems. I would love to find something besides Fels Naptha that cleans well. 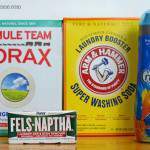 We can’t stand the smell of fels naptha at our house. I made made laundry soap with it once and my family begged me to throw it out. Oh no, that’s not good at all. I’ve heard that some people have successfully used zote soap instead of Fels Naptha maybe that would be a better option for your family althought I’ve never picked it up at the store to smell it, it might smell just like Fels Naptha. You could also substitute Ivory bar soap instead if you like the smell of it better. I hope one of those options will work for you. Thanks Shelly, I will look into the Zote soap next time I decide to mke laundry soap. ZOTE does not smell llike Fels Naptha. I don’t like the Fels smell either but I like the way it cleans. I use some doTERRA On Guard in my batch – about 30 drops – and love that smell. 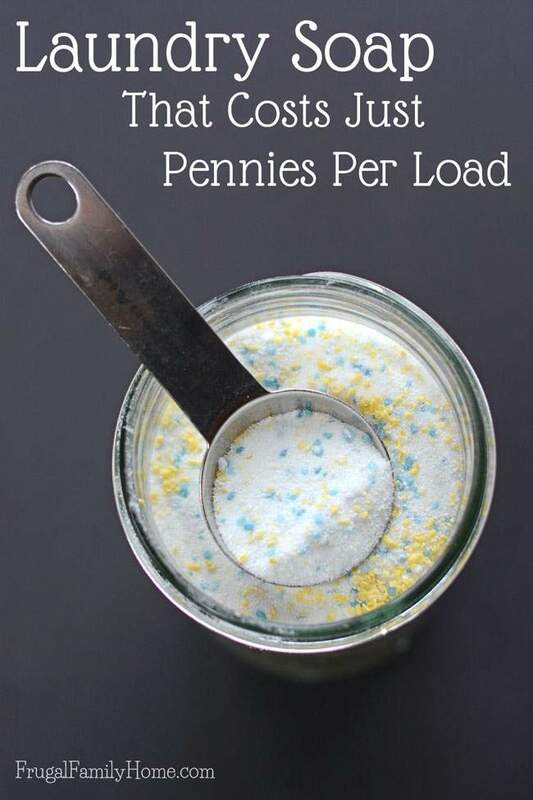 I also use baking soda – 1/2 c – in a load that has smelly clothes. I also put my bar in the microwave. I put it on a paper plate. I do it on high for one minute and then cut it into smaller pieces. I then microwave for another minute at 50% power. Then it can be easily crumbled. I put the cooled pieces in my food processor and in a few seconds it’s very fine. If your bar is older and dried out the bar doesn’t soften as well. If you leave it in too long it can burn. These times are safe in my microwave. If the pieces don’t soften enough in your microwave, you can always be sure the pieces are spread apart on your plate and add another minute at 50% power. I use a salad shooter to shred the soap, works very time. Thanks for adding your tip for shredding the soap, Jackie. After leaving Lowes and Tractor Supply and finding nothing, I found everything at Walmart. Washed a load of towels and I’m thinking this is a keeper. Thank you for saving me money. I just made my first batch of Diy Laundry detergent. And I must say I am impressed. I use it in combination with my Diy fabric softener and it works great. The only down fall is I like to see bubbles and this does not produce any..
After grating the bar soap, I put some of the grated soap shavings in my food processor and pulse several times to get the soap broken down into tiny pieces…so much faster for the soap to dissolve in the washing machine. I did add some washing soda to the food processor while doing this which also helped coat the shaved soap and prevents clumps from forming. I divided the soap shaving/washing soda into about 4 or 5 batches—-trying not to overcrowd the food processor. Then I just add all the remaining ingredients and mix well, put into air-tight containers with labels and we are set for about a year! Thanks for sharing your tips, Katie! Is there a different amount of detergent to use if you have an HE machine? Joanne, In my HE machine, I use a tablespoon per load and it works well. I had an allergic reaction to the detergent. is there a scent free perfume free color free formula? Debbie, I would try it without the Purex crystals. I know my daughter and hubby can have reactions to laundry detergents and removing the crystals does the trick for them. Hopefully, that will be a good solution for you too. I’ve also seen other recipes that use Ivory soap instead of Fels Naptha. I haven’t tried it myself but it might be another good option for you to try. I use dawn dish washing soap to wash everything except for the towels. I do purchase laundry detergent , bleach and unstoppable to wash the towels. I purchase these items with coupons and when they go on sale, so I always have a supply on hand. I will try this and I most likely will never go back to detergent again. Someone was asking if we could use bleach with this soap and I have been using it with it and it is ok. I got this recipe from my DIL (dry version). 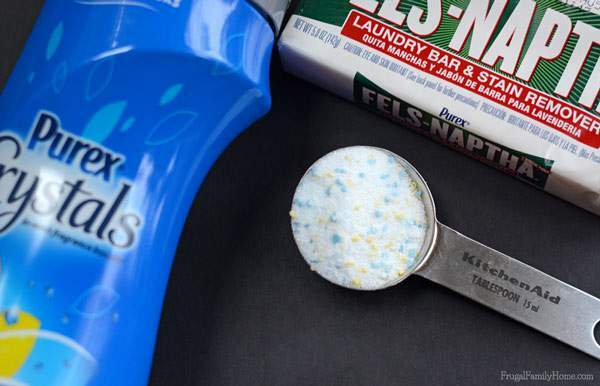 It worked great for a while, but she heard that Fels-Naptha has changed their formula, and it’s not getting my clothes as clean as it used to. Is there another bar soap that works the same way? Pam, I recently purchased a new bar of Fels-Naptha and didn’t notice a difference. An alternative that might work as well is Zote soap. Hi, living in the U.K., is there equivalent products available to those listed that can be purchased here. I live in Scotland where the water is very soft. Would love to try this recipe in my front loader. Martin, I believe you can get the items from Amazon, but I’m unsure of what the equivalent products would be where you live to purchase them locally, maybe someone can chime in and help. We too have soft water and it works well. Does this work on cow manure? We live on a dairy farm and need something that will take those “certain” stains out!! Bonnie, I’m not sure how well it would work on cow manure. I’ve never had to remove it from my clothing. I’ve gotten lots of stains out of clothing using Fels Naptha bar as a pre-treater. I’ve even gotten grease out of the carpet with Fels Naptha. I assume it would work well, but it may need a little pretreating. I have a similar recipe. I find that if I grate the laundry bar on my large hole grater it is much faster. then i put the flakes on paper plates on top of the book shelves it gives my house a lovely smell. in a few days the flakes are dry and blend up much easier in the blender. one concern i have is that my recipe calls for a full bar of the felds naptha with one cup each of the borax and washing powder. will so much laundry bar hurt my clothes? Sonja, the recipe uses a full box of borax and washing soda to one bar of Fels Naptha. 2 large boxes of baking soda. I leave it in powder form. I use 1/4 to 1/2 cup depending on the dirtiness of the laundry. My family and I have super sensitive skin this works well for us. And lasts forever. Thanks for sharing your recipe, Chrystal. Is there an alternative to this naphta bar? It doesn’t seem available in Quebec. I’ve heard of people using Zote or Ivory soap instead of the naptha bar. You might try one of those. Basically, you just need a good bar of soap? Savon de Marseille maybe? I would think so, I usually use the naptha soap because it works so well. I’m not familiar with the one you mentioned though. I was unable to get the Fels-Naptha last time and used Zote. In my opinion, it had a very strong scent in my container. Thankfully, that didn’t carry over to my clothes. They smelled fine; clean, but not perfume-y. I’m also wondering if anyone has had issues with a waxy film or buildup in their front-loader? I’ve made this detergent several times. I omit the fragrance booster due to sensitivity among family members and it is just fine without it. So little of this soap is needed per load and the clothes come out clean and fresh. In place of the fragrance booster, I sometimes apply some essential oil to a wool dryer ball and get good results. Dorothy, that is a great tip! Thanks for sharing it. My husband and I recently made this and we are very pleased. I use 3 tablespoons per load and our clothes come out nice and clean. Thank you for sharing. I have been making the liquid version for many years. Can’t imagine how much money we have saved!! My recipe is a little different, so was just wondering if I’m doing it incorrectly. I boil water with grated soap then pour it in 5 gallon bucket .Add washing soda and borax. Mix until melted/dissolved. Then add cold water, stir, and put lid. I use about half cup in each load of laundry. Please let me know if I’m adding too much of something! Tina, I haven’t made a liquid version for years. But if you are getting good results with your recipe I’d stick with it. I have had great results. Just thought if I was adding to much while making it, I could cut down and save product.